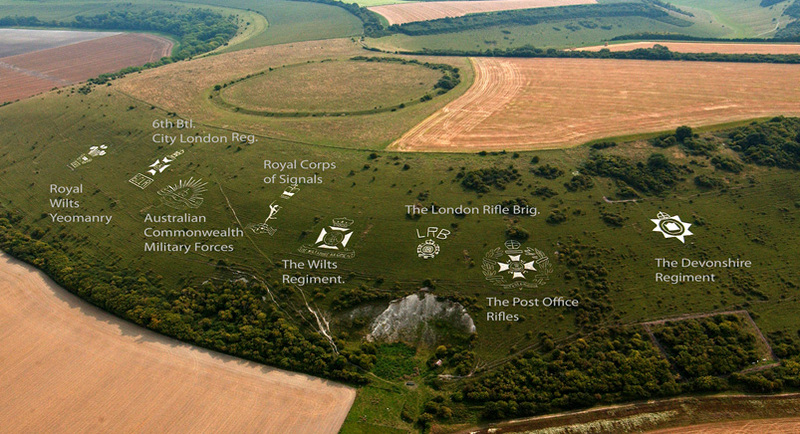 At the time of writing (November 2014) the Centenary of the outbreak of World War One is upon us and in 2016 it will be the Centenary of the first badge (believed to be the London Rifle Brigade Badge) being cut by the troops stationed at Fovant. Many visitors to the badges imagine that they all date from WW1 but this is not the case only five of the eight surviving badges date from that time. The Royal Wiltshire Yeomanry and the Wiltshire Regiment date from 1950/51 and were built by the former Fovant Home Guard troop and other villagers so in a sense they were both WW2 badges. In 1970 troops of the Royal Corps of Signals built their badge to commemorate the fiftieth anniversary of the founding of the Corps. So the badges that we see on the hillside today have been constructed throughout the twentieth century. 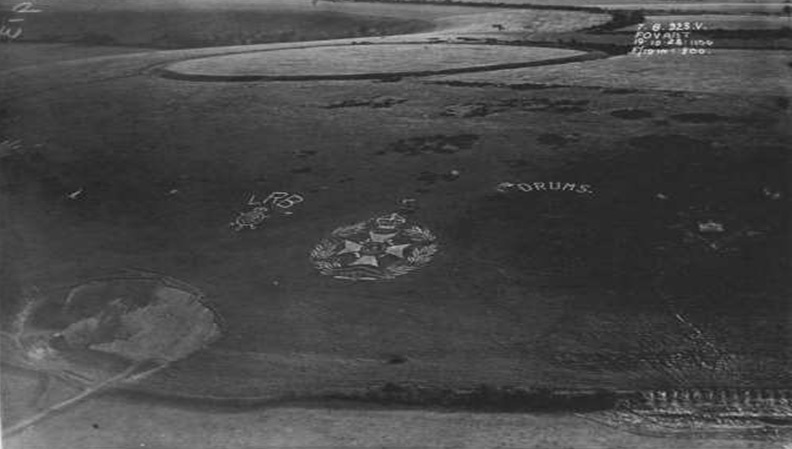 To return to WW1, including badges at Compton Chamberlayne and Sutton Mandeville there were about twenty large military and other insignia carved by the soldiers stationed in the area. In addition, the soldiers carved many smaller images and inscriptions to record their presence. 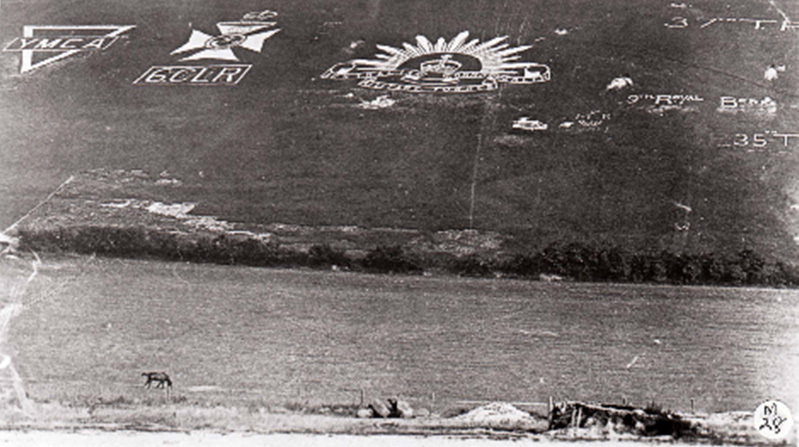 When Fovant Camp was closed in the 1920s obviously the troops were not around to keep the badges in good condition. Some of the Regimental Associations did pay local people to maintain the badges but some did not. From around 1919 the Australian Government made arrangements for their badge to be maintained. The Australians continue to have a close association with their badge and make a major financial contribution to its upkeep every year. We also have an officer of the Australian Army seconded to the Trustees Committee. A view of the western badges taken in 1928. The Devonshire Badge is in very poor condition and the Drums beneath the “Drums” legend are not visible. By the late 1920s, the badges were in poor condition, indeed an article in The Times in 1928 (The tenth anniversary of the Armistice) complained that some action should be urgently taken to restore the badges left by the troops stationed at Fovant in WW1. The various Regimental Associations did take action and funded local people to repair the badges. 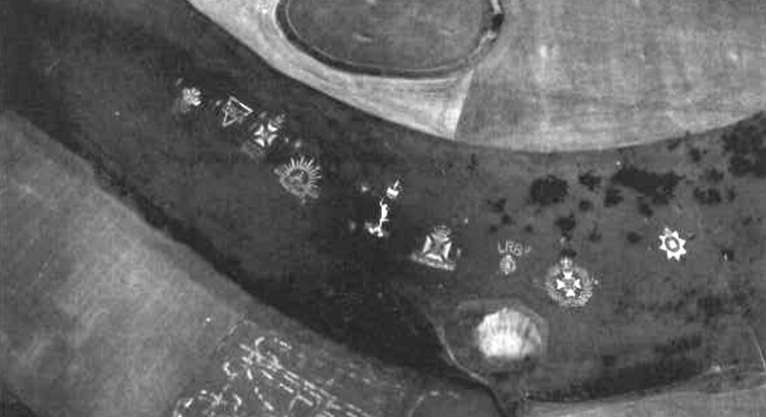 Aerial picture of the badges taken in 1930. By the 1930s the condition of some of the badges had improved significantly. The picture taken in 1930 clearly shows how the repairs to the badges funded by the Regimental Associations have improved the appearance. 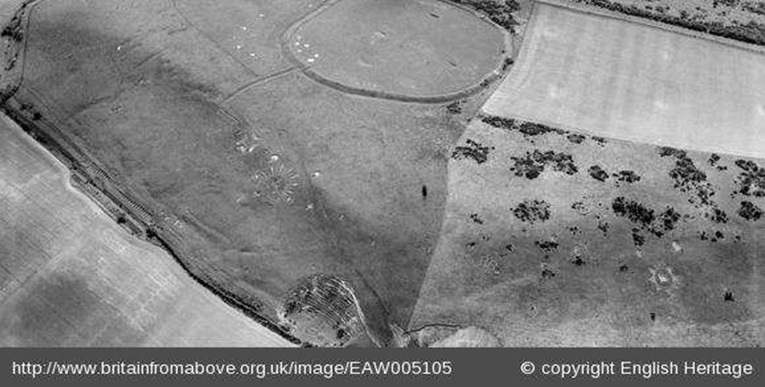 Compared to the WW1 picture though virtually all of the smaller images have disappeared and the “Drums” continues to fade back to grass. 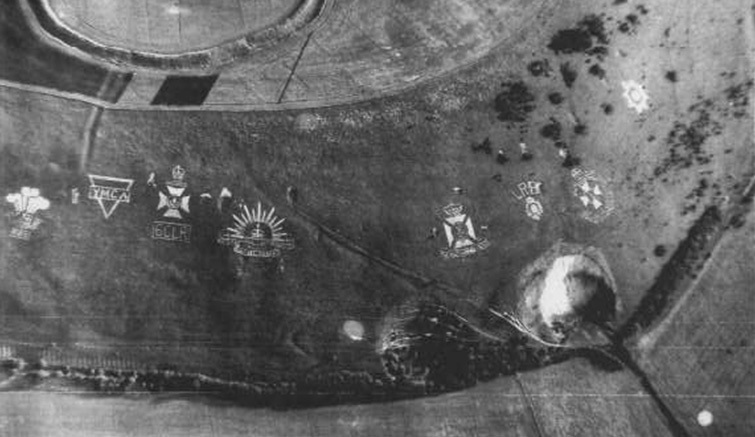 Aerial picture taken in 1947. So by the late 1930s many of the badges had been restored although it is clear that a number of WW1 badges had faded and virtually all of the smaller images had disappeared. During World War Two instructions were issued that the badges should be covered up so that they could not be used by enemy aircraft as a way marker to potential targets. The picture taken in 1947 shows just how successful this had been with many of the badges, even allowing for the distances involved, had all but disappeared. Salvation was at hand though as the Fovant Home Guard Old Comrades Association (Which became the Fovant Badges Association in 1961) decided to restore some of the badges and to build two new Wiltshire regimental badges since they had been attached to these regiments. 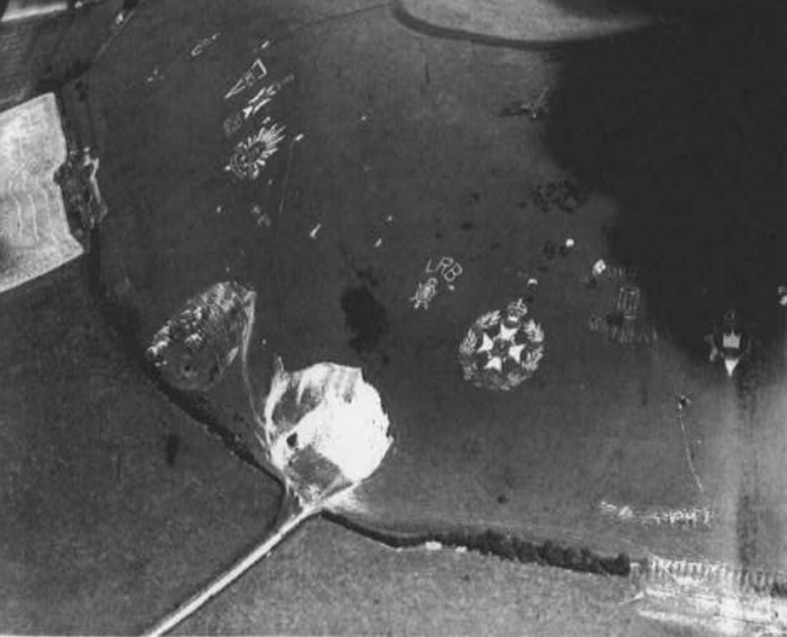 Picture of the badges in 1967. The two new badges were built in the early 1950s. The Royal Wiltshire Yeomanry is on the far left in the 1967 photograph and the Wiltshire Regiment is the fifth badge from the left. This 1960s photograph does show though how much the badges had changed over the 50 years or so since WW1. Note also that the familiar Royal Corps of Signals badge is not to be seen, it has not yet been built. The badges in 1971 – very close to the current array of badges. Towards the end of 1970 soldiers of The Royal Corps of Signals took around three months to build their badge to mark the Fiftieth Anniversary of the foundation of the Corps. They continue to provide funds to the FBS for the maintenance of their badge. The Fovant Badges following restoration in 2002/3. By the end of the Twentieth Century the badges were once again in poor condition and so a major effort was made by the Fovant Badges Society Trustees to seek funding for a further restoration. Many individuals and institutions contributed. The Heritage Lottery Fund contributed the largest amount so that by 2002/3 the restoration could start. It was decided not to restore the YMCA badge. This very brief review of the badges story illustrates just how much the composition of what we know as The Fovant Badges has changed over the last century. Perhaps more importantly the history of the badges shows us that from time to time their survival has been in doubt. Sometimes from major events such as WW2 or from subtle changes in the way that our predecessors viewed the relevance of these chalk monuments. Sadly we cannot therefore assume that there will always be a will to maintain the badges in their current excellent condition.